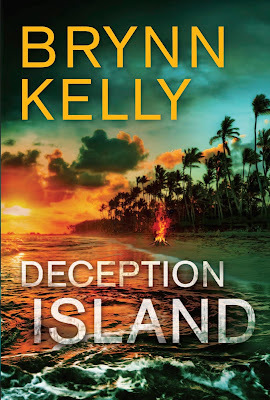 Just Romantic Suspense: What makes a good beach read? Congratulations to Anita S., the winner in Brynn's giveaway. Thank you to all who participated! Do you find that reading on summer vacation or a day at the beach is a whole different thing from everyday reading? With lazy days and (perhaps) long flights, we have more time to get lost in a story, but we want something that suits our elevated, carefree mood. (And those of us with young kids need a book we can pick up and put down without losing track of the action.) Here’s what I look for in a beach read. How about you? 1. Plot, and lots of it. 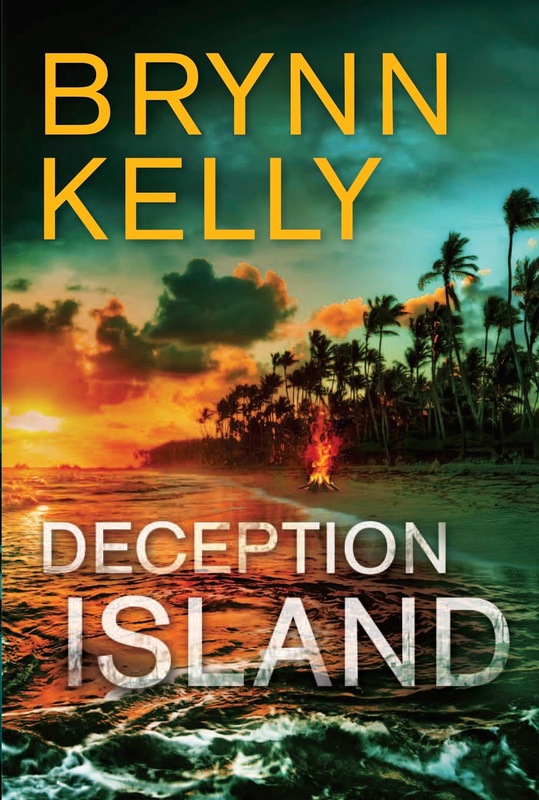 Anyone who’s read DECEPTION ISLAND will guess that I’m sucker for books where plenty of stuff happens and the characters are challenged to respond. Even more so when I’m chilling out on vacation. Just because I’m lying back, drinking a cocktail, I don’t want my characters to be. Take them on a thrill-ride, make life difficult for them, make them work for their HEA even if I’m sitting in mine. 2. Atmosphere. Crack out those exotic settings. Make me shiver with an Arctic chill while I’m sitting on my tropical beach. Whisk me to the glamor of a European city or the isolation of a cabin in the woods. Have me looking over my shoulder to check that’s really a palm tree and not a serial killer. Scare me a little, and make me feel like I’m on a round-the-world ticket even if I’m a ten-minute drive from home. 3. Beautiful writing. Give me those eloquent, lyrical paragraphs I want to read over and over—because today, I have plenty of time to relish them. 4. A takeaway. I like a lighter, escapist read when I’m at the beach, but I also love it when the book sticks in my mind long after I’ve finished it. With the luxury of time, I can ponder themes, sift through layers of meaning and chuckle about the funny scenes, so books with hidden depths are perfect. 5. A happy ending. Bad stuff can (and should!) happen, hard lessons can be learned, but I don’t want to arrive at happy hour feeling glum. I want to be uplifted and inspired. I want to see that book in my bookcase or on my Kindle for years to come and remember the wonderful vacation it took me on. What books do you take on vacation, and why? What books are you looking forward to reading this summer? 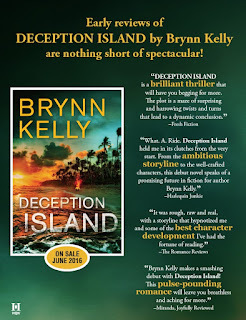 Respond in the comment section to be in to win a hard copy of DECEPTION ISLAND! A rogue French Foreign Legion officer and a Californian con-woman become unlikely allies—and lovers—in a life-and-death battle against 21st century pirates and slave traders, in the steamy jungles and azure waters of an Indian Ocean paradise. As their lives are plunged into danger, their damaged hearts and minds reluctantly begin to open to the possibility of finding love in the most unexpected of circumstances. When loyalties are tested and damning secrets revealed, will their fledgling trust in each other hold strong enough to pull them through? 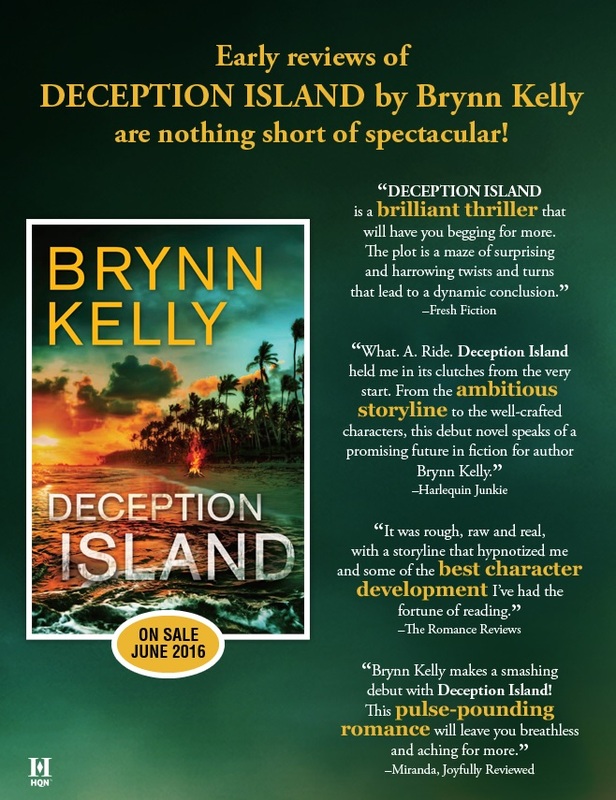 It took award-winning journalist Brynn Kelly only two decades to realize all those stranger-than-fiction news reports (pirates, mercenaries, murders, conspiracies…) provided the perfect training for a new career: as a writer of larger-than-life novels. She’s delighted that HQN Books is publishing her Golden Heart® Award– nominated debut novel because it gives her an excuse to spend her days in a bubble of delicious words and fiendish plots. Still, after all those years writing about the real world, she’s secretly terrified someone will realize she’s making it all up. Brynn has a degree in communications with a journalism major and has won several prestigious writing awards, including the Valerie Parv Award and Pacific Hearts Award. She’s a bestselling author of four nonfiction books in her native New Zealand. Giveaway ends 11:59pm EST May 25th. Please supply your email in the post. You may use spaces or full text for security. (ex. jsmith at gmail dot com) If you do not wish to supply your email, or have trouble posting, please email maureen@justromanticsuspense.com with a subject title of JRS GIVEAWAY to be entered in the current giveaway. I enjoy whatever calls to me from my TBR pile! I have a nice range of books within the Romance genre to read! I usually choose something light and short (maybe an anthology) because I need my mind to rest and I don't want to think too much. I'll usually just grab books from my reading list. Whatever I feel like at the time. I like to read an action packed suspense romance. It has to be something where I'm so involved in reading that I don't realize what time of day it is. I like to read a good romantic suspense when on vacation!